NEW YORK--(BUSINESS WIRE)--Apr. 9, 2018-- L3 Technologies (NYSE:LLL) announced today that its new Iver Precision Workhorse (Iver PW) autonomous undersea vehicle (AUV) will be featured at its exhibit (Booth 2339) at the 2018 Sea-Air-Space Exposition hosted by the Navy League April 9–11, 2018, at the Gaylord National Convention Center in National Harbor, Maryland. The new Iver PW is the first in a family of advanced, highly capable military AUVs to address a wide variety of customer missions, including multi-domain intelligence, surveillance and reconnaissance (ISR), anti-submarine warfare (ASW), seabed warfare and mine warfare. L3 Technologies' Iver Precision Workhorse autonomous undersea vehicle with low-drag side scan and bathymetry transducers. Photo courtesy of L3 Technologies. “The Iver PW demonstrates L3’s ingenuity and customer focus in developing next-generation processing, autonomy and power technologies to enable new capabilities and missions for a real-time tactical advantage in the field,” said Jeff Miller, L3’s Senior Vice President and President of its Sensor Systems business segment. 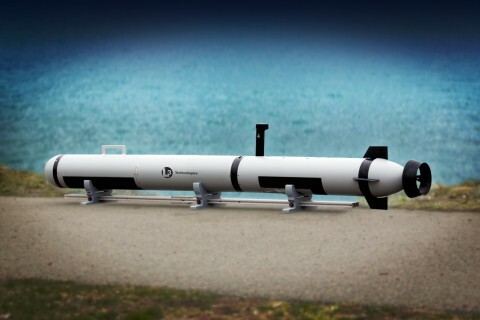 The company plans to demonstrate other AUV technologies at Sea-Air-Space, including its novel aluminum-water AUV power module developed by L3 Open Water Power for lithium-free safety and extended range, as well as its theatre ASW simulator developed by L3 Adaptive Methods. Visit L3 in Booth 2339 to view these demonstrations and more. The Iver PW is developed and manufactured by L3 OceanServer in Fall River, Massachusetts, which is part of the Advanced Programs sector within L3’s Sensor Systems business segment. Since its inception in 2003, L3 OceanServer has sold more than 300 AUVs worldwide, providing highly capable solutions to a broad array of military, commercial and international customers.